Google has two different frontends (interfaces) for getting train directions from the Google database. In theory, both should produce the same result, but as you will see, this is not the case. We encountered some of the same issues we detailed here, though this time they happened even though we have the phone set to a Japanese environment. It is becoming more clear that these problems are on the "maps" side of google. Additionally, there appears to be no link to Transit on the google mobile home page (but there really is). The link to Transit is actually called Nori-kae annai. The link to Nori-kae annai is also called, you guessed it, Nori-kae annai. Depending on where you click on the google home page, you are sent to a different frontend. 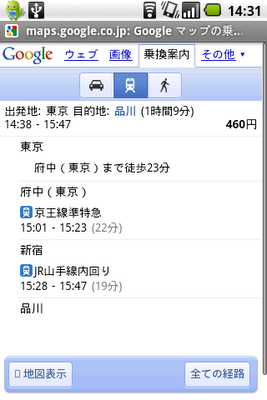 PROS: Departure, arrival, last train option. 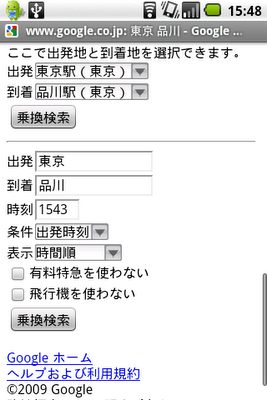 Allows English input if appended with "station." (Tokyo station, for example, must be typed.) 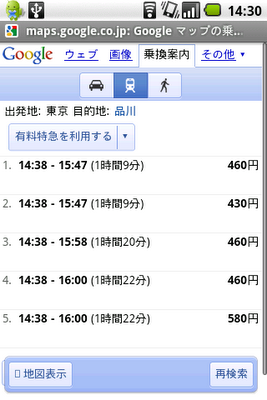 Option to change departure/arrival time by present amount (for example 5 minutes). Shows route map. Allows choice between walking, auto or train. Uses location aware services. Mimics function of Maps app that is not yet official available in Japan. Provides for free much of the same functionality as Navitime's paid service. Has the potential to provide a useable work around for searching for station names from a phone set to English by forming the URL and bookmarking it. CONS: Not available from google.com English page. Cannot specify connecting stations (経由駅). Gives same bad results as searching from a phone set to English. 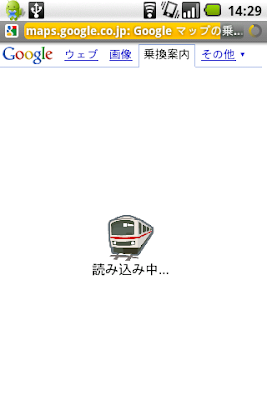 Heavy to startup; don't use it if you want to know quickly when the next train is departing. 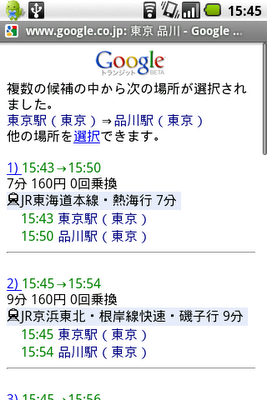 No option for retrieving train schedules. No option for train advisories. No option for first train. No option for saving favorites or history (because browser based). Not always available. We like that this has the same functionality as the updated map app, but we find it pretty much unusable because it has a very long load time, probably due to heavy ajax scripting (but we are just speculating). In addition, search results are inconsistent. We did our favorite Tokyo to Shinagawa search and were completely surprised to see that the result that pops up is… the same result as when performing this search from maps.google.com! Even though we are set to a Japanese environment! See here for more details. Searching from a PC, however, works. 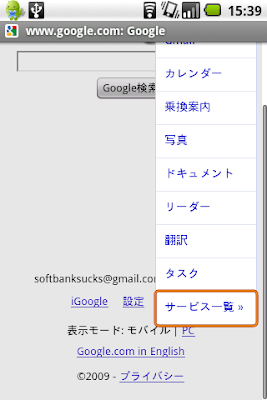 There is no link to this on the google.co.jp Japanese page. 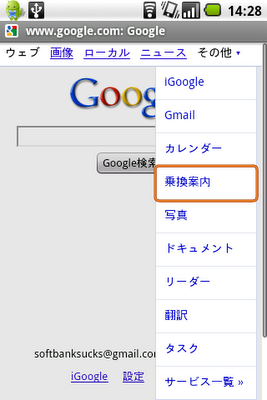 From the google home page select "more" (その他) and click on "nori-kae annai" (乗換案内). Next, you get to stare at this screen for a long while, even if you are using wi-fi. The app will try and guess your location based on GPS or wifi and suggest this as a start point. (We have location awareness turned off.) 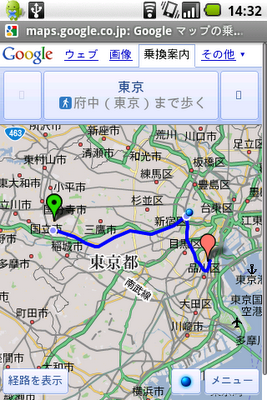 We entered Tokyo (東京) to Shingawa (品川). As you can see, the results seem dubious. Again, we are starting at our favorite rental mansion in (Palace Mell) in Fuchu City. But you can get a nice map of the route, which shows our location, though it is completely wrong (since we have turned off location awareness). Probably appending 駅 (station) to the station name, would fix this problem, but no other Japanese train search engine requires this. CONS: Not available from google.com English page. Cannot specify connecting stations (経由駅). No option for retrieving train schedules. No option for train advisories. No option for saving favorites or history (because browser based). No option for first train. No option to change departure/arrival time by a preset time (1 minute ahead for example). This is the typical interface for getting train directions that most users (who don't pay for Navitime) are probably accustomed to using. It could be improved by adding the ability to quickly adjust departure/arrival time, and by also adding the option for a first train departure. A quick link to train schedules and advisories would be useful as well. 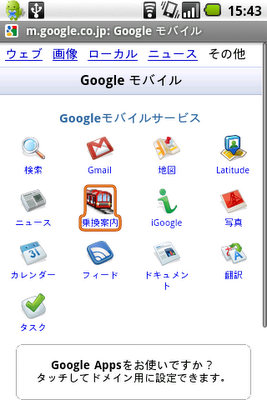 On the google.co.jp Japanese home page, click the "more" (その他) and the "even more" (サービス−覧). From here, choose 乗換案内 (Nori-kae annai). You'd think you are accessing the same service detailed above, but you are not. Now you are at the typical mobile interface for getting train directions from google, into which we entered our favorite search. And out comes proper results.